A carers job can be 24/7. Often there isn’t time to complete odd jobs around the home, run errands or do those jobs you just keep putting off as your caring role takes priority. But with the Time Swap scheme you can get help to do those jobs and in return offer your own skills, hobbies and interests to help out others. As a carer you’re probably thinking ‘I don’t have any free time to help anyone else’ or ‘the person I care for cannot be left at home alone’. That's understandable, but Time Swap is flexible and you can offer your time in return by doing something that suits and fits around you. You can offer all sorts of things….. the list is endless. Time Swap is coordinated by Derbyshire County Council with help from voluntary groups around the county. The scheme works by offering skills you have, or hobbies you enjoy doing, to other Time Swap members who need a bit of help. Doing this will earn you ‘time’. The ‘time’ you have earned can be used to ask other members to support you with tasks that can help in your caring role or generally. You get an hour free when you join to get you started. There's no obligation - you can dip in and out of scheme and offer/receive as many hours as you like. There is no minimum amount of hours that you need to give or take. The latest Time Swap newsletter for Erewash will give you a good idea of the type of things people swap through the scheme. Lynn lives in Ilkeston and has been the main carer for her husband John for over 20 years. John has physical problems and also struggles with mental health issues, so Lynn has to help him get around and complete every day activities. 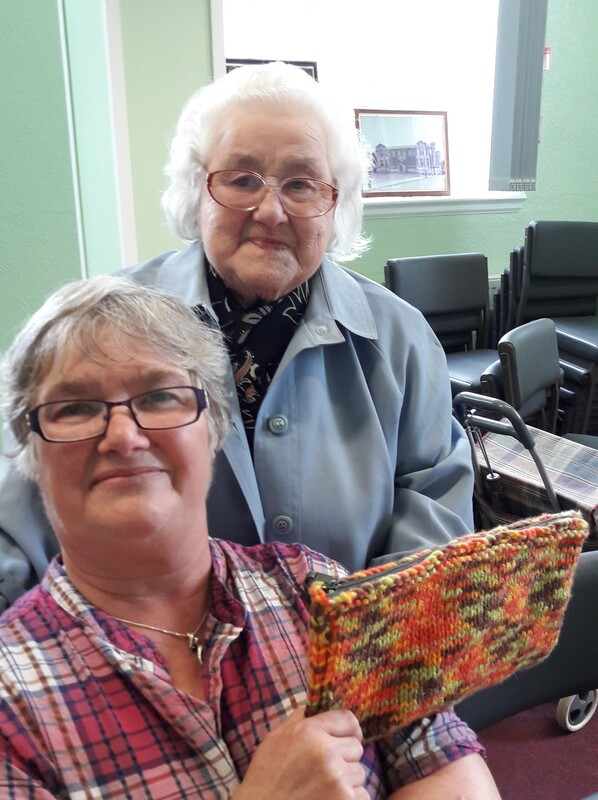 Lynn is a long standing Time Swap member and mainly offers knitting to the Time Swap scheme, as this is something she can do from home without leaving John and her caring role. In return for the ‘time’ Lynn has banked by helping others, she has received support back from other Time Swap members. She has received lifts to the tip to get rid of rubbish and Time Swap members are building raised flowerbeds in Lynn and John's garden so they can both enjoy being in the garden this summer. Lynn has found that getting 'time' back from Time Swap has really helped her with tasks she cannot manage herself as well as improving quality of life for both herself and John. The Time Swap scheme has helped Lynn’s make new friends and become part of a group, all while giving back to the community. She offers her skills and help with things such as knitting twiddle muffs for people with Dementia and cuddly toys to raise money for different charities. Lynn has also been able to develop her knitting skills and learn from others by being part of the knitting group. As well as it having a positive effect on her caring role, Time Swap has also given her the chance to have a break and enjoy her own hobbies and interests. This helps to make her feel ‘more than just a carer’. Time Swap has also provided opportunities for John. Every month a newletter is sent out to Time Swap members in Erewash with a list of what people want help with. Lynn noticed in the newsletter that a Time Swap member wanted someone to come to play dominoes with them. Lynn saw this as a great opportunity for both John and herself. It helped someone else out by giving them a dominoes partner, but was also great for John as he really enjoys playing and has made a new friend. Picture: Lynn (front) is pictured with Jessie from her knitting group. The Time Swap Project officers run information sessions where you can drop-in and talk to the officers and other members of the scheme. The next planned drop-in sessions are listed in our news section. Or why not contact the officers to see when they are coming to a venue near you? In Erewash swaps are advertised through the monthly newsletter but in the rest of the County swaps are arranged through the Project Officer who acts as a broker. Joining Time Swap is easy, you can sign up online. To help keep people safe all Time Swap members have to provide two references before they can join the scheme. Your referees can be friends, family members, employers or a health professional who has known you two years. If you are swapping time with vulnerable adults on a one-to-one basis a DBS check will need to be carried out. You can contact the Time Swap project officers (number above) to find out more about this. You can also read the Time Swap handbook.